Difference between revisions of "Edward Tiffin"
Edward Tiffin was the first governor of Ohio. Tiffin was born in Carlisle, England, on June 10, 1766, although many sources list his birth date as being nine days later. He served as an apprentice to a physician in Great Britain from 1778 to 1783, learning the medical profession. In 1783, he moved to America with his parents, where he eventually established a medical practice in Charles Town, Virginia. He played an active role in the Methodist Church and became a lay minister in 1792. In 1798, Tiffin and his family moved with his brother-in-law, Thomas Worthington, to the Northwest Territory. The group arrived in Chillicothe on April 17. Tiffin and Worthington brought several recently freed slaves. The two men quickly became involved in politics in the Northwest Territory. Governor Arthur St. Clair appointed Tiffin chief clerk of the Northwest Territory's Court of Common Pleas. In 1799, Tiffin served in the legislature of the Northwest Territory. His fellow representatives selected him to become the first Speaker of the House. Three years later, Tiffin served as president of the Ohio Constitutional Convention of 1802. This body drafted a constitution so that Ohio could formally enter the United States of America as a full state. Tiffin often was in opposition to Governor St. Clair. St. Clair was a member of the Federalist Party. Many residents of Ohio at this time, including Tiffin and Worthington, supported the Democratic-Republican Party. St. Clair opposed Ohio statehood because he believed that the Democratic-Republicans would gain control of the state government. The governor hoped to shrink the proposed boundaries of Ohio and delay admittance to the United States. These two actions would assist the Federalists in securing Ohio for their party. Despite St. Clair's efforts, Tiffin, Worthington, and other Democratic-Republicans helped Ohio become the seventeenth state in 1803. 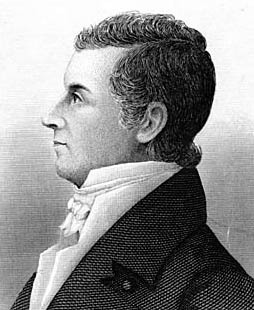 In March 1803, Tiffin became the first governor of Ohio. As governor, Tiffin faced numerous difficulties. One pressing issue centered upon tensions with the Native Americans, especially with the Shawnee natives and their chief Tecumseh. During the early 1800s, Tecumseh attempted to form an Native American Confederacy. He wanted the natives to put aside their personal differences and to unite together against the Americans moving into Ohio and the Indiana Territory. Tiffin also was concerned with the British in Canada and along the Great Lakes, including on American soil. The Treaty of Paris (1783), which ended the American Revolution, required the British to withdraw all of their soldiers from America. The British failed to do this. During the late 1700s and early 1800s, the British provided natives, including Tecumseh, with weapons to battle the United States. Tiffin was reelected as governor in 1805, remaining in office until January 1, 1807. In 1807, the state legislature selected Tiffin to replace Thomas Worthington as a senator in the United States Senate. Tiffin resigned the position in 1809, hoping to return home to continue his medical practice. In that same year, he was elected to the Ohio House of Representatives. His fellow legislators selected him to be the Speaker of the House. In 1812, President James Madison named Tiffin as the chief commissioner of the United States General Land Office. When the British invaded Washington during the War of 1812, Tiffin moved the records of his office so that they would not be seized or destroyed. In 1814, Tiffin became the Surveyor General of the Northwest. This position allowed him to return to Ohio. He served as the surveyor general until his death on August 9, 1829. Tiffin, Ohio, is named in Tiffin's honor. Edwards, Linden F. "Governor Edward Tiffin: Pioneer Doctor." Ohio History 56 (October 1947): 349-361. Galbreath, Charles B. History of Ohio. Chicago, IL: The American Historical Society, Inc., 1925. Utter, William T. The Frontier State: 1803-1825. Columbus: Ohio State Archaeological and Historical Society, 1942.